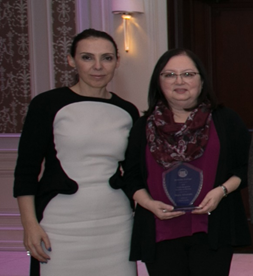 Photo Caption (above): Professor Doris Alvarado, MD, Berkeley College School of Health Sciences (above right), receives the Excellence in Teaching Award during the 2018 Berkeley College Faculty Recognition Awards dinner, held on November 14, 2018, at The Terrace in Paramus, NJ. She is pictured with Eva Skuka, MD, Dean, Berkeley College School of Health Studies.“I think a great teacher connects with every student that enters his or her classroom,” said Dr. Alvarado.“On the first day of class, I engage with the students individually to learn more about who they are, why they have chosen a career in the medical field and what their expectations are for my class. Knowing my students well provides me the information needed to establish an optimal learning environment for each one of them, ensuring they leave each day with new knowledge and a desire to return for more.” Dr. Alvarado is a resident of Scotch Plains, NJ. Below (L to R) are: Eva Skuka, MD, Dean, Berkeley College School of Health Studies; Doris Alvarado, MD, Berkeley College School of Health Studies; Donald Kieffer, PhD, Dean, Berkeley College School of Liberal Arts; Michael J. Smith, President, Berkeley College; Beth Castiglia, PhD, Provost, Berkeley College; Jonathan Weidenbaum, PhD, Humanities and Social Sciences, Berkeley College School of Liberal Arts; Kevin Luing, Berkeley College Board Chairman; Elana Zolfo, EdD, Dean, Jonathan Ng, PhD, Management; and Ronald Boswell, Accounting and Finance, all of the Berkeley College Larry L. Luing School of Business®. Drs. Alvarado, Weidenbaum and Ng are all recipients of the Excellence in Teaching Award. Mr. Boswell is a recipient of the Commitment to Students Award.